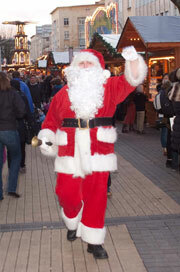 Bristol German Christmas Market is open on Broadmead this year from 8 November to 22 December 2013. Bristol is served by the M5 and M4 motorways. There is extensive parking at Cabot Circus (5 minutes fom the Chrismas Market). Bristol also has a great park and ride system. Bristol Temple Meads is Bristol's main railway station, about 15 minutes' walk from the City Centre. The 8 and 9 bus services run frequently between Bristol Temple Meads Station and Broadmead/ Cabot Circus. Bristol Bus Station is located on Marlborough Street (5 minutes fom the Chrismas Market), near Broadmead shopping centre.